Yellow Paintbrush Photo, Wrangell - St. Elias NP, Alaska. 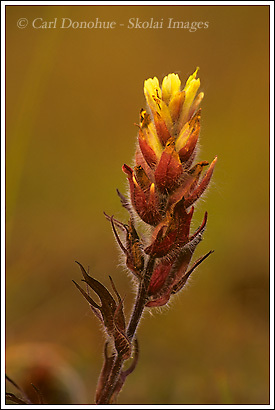 Here’s a photo of a Yellow or Coastal Paintbrush (Castilleja unalaschensis). Taken in Wrangell St. Elias National Park, Alaska. I’m eagerly waiting spring this year here to really get some more photos of the flowers in the area. The flowers don’t really hit the high country until July, but hopefully I’ll get some opportunities in the lower country, in the forest, in the spring. This entry was posted in Alaska, Flowers, Wrangell - St. Elias National Park on March 25, 2008 by Carl D.
Hmmmm, wonder if we should let Carl know Alaska doesn’t really have spring, just winter, summer and oh yeah break-up…..
Is that true? No spring at all? I know what you said isn’t true, because I know there’s a fall/autumn season – I’ve seen it. The whole week long. Very Indianish. Very , very beautiful! Hey buddy, never saw these before, but this shot makes me wish I had.